During World War II, Jack Chambers survived battle after battle, along with a few members of his unit–the Lucky Seven. 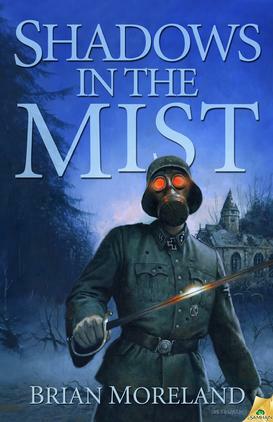 Drafted for a secretive mission into the depths of the Hurtgen, a dark, eerie German forest, Jack and his men join up with a team of special forces soldiers to take down a horrifying Nazi occult experiment. The records of the mission are kept sealed, lost forever except to the two survivors–Jack and one other man, a rabbi who seems afflicted with the same dark nightmares and mysterious scars Jack has. Now, on his deathbed, Jack has one request for his grandson, Sean. Reading this book was like watching an old black and white war film. Even though it only lightly grasps the reader’s interest, you just sort of hang on and plow through. The story is well-crafted and well-written. Each character is fleshed out and written in such a way that you feel like you known these guys. The gore is light, but it’s good. In regards to the violence in the novel, it focuses more on the emotional reactions of the survivors. That’s not a bad thing in any case, but here it was almost like an attempt to weigh down an already-heavy plot. Speaking of which, the plot is a little heavy, and while the subjects–Jewish mysticism, gollums, Nazi occult secrets– are all fascinating on their own, for some reason, they just seemed sort of ho-hum. I couldn’t gather enough real interest in the events to care if the soldiers made it out of the scary medieval German castle alive. By the time something actually started to happen, I was mentally ticking off the members of the unit to see who was still left and who had yet to die. I think my biggest issue with the book was how slow it progressed. I would sit down and read several chapters and realize absolutely nothing of consequence had happened. For all the perfect editing, amazing world building, and awesome character-development, this book was just plain dull. Moreland did his history homework–there’s not a single negative thing I can say about the excellent world-building. I admire the character work. As I said, each one was crafted so solidly they felt like real people. The book is very well-written, the story airtight. I loved the gollums as the monsters. It’s a refreshing change from the usual supernatural bad guys. Even the Kabbalah plot line added a level of interest to the story, taking it a little further from the usual Nazi cult plots out there. If you can get past the turtle-slow pacing of the first 5/8ths of the book, the conclusion is satisfying enough to almost make up for the other issues. Visit Brian Moreland’s website and Samhain Publishing for more info. This entry was posted in Novels, Reviews and tagged Brian Moreland, Samhain Publishing, Shadows in the Midst by adrolandauthor. Bookmark the permalink.